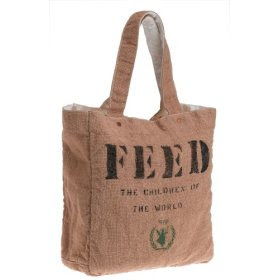 The FEED bag is a joint project between Lauren Bush, Honorary Spokesperson, and the United Nations World Food Programme. $34 from the sale of each bag goes to FEED one hungry child in school for one year. The bag is fully reversible - one side is made of brown sacking and the other side is made from white canvas and has lots of useful pockets. Find out more at the WorldFeedbag.org website or buy it from Amazon.com.